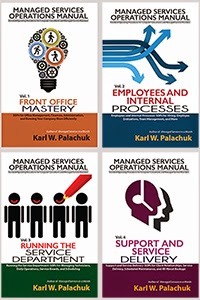 Small Biz Thoughts by Karl W. Palachuk: SOP Friday: Technician Supplies -- The "Scary Box"
SOP Friday: Technician Supplies -- The "Scary Box"
No matter how small your business is, you will need to provide your techs with certain supplies. The nature of what you need to provide changes over time. But you should have an official list and make sure your techs have what they need. A $4 cable becomes a $60 cable if you have to pay your technician to drive back to the office and pick it up! 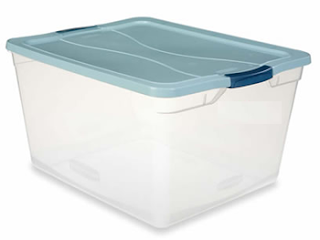 We provide technicans with a plastic Rubbermaid-type box to carry in their trunk. It keeps the materials safe and orderly. In addition, this makes it easy for the tech to take these materials out of the trunk as needed. We call this the "Scary box" because it gets disorderly pretty fast. When techs are stressed out or in a hurry, they tend to dig through the box and never get around to straightening it out. We have techs bring the box to their quarterly review. It is never in order. Really. But the quarterly review is a time to get it back in order and make sure all supplies are up to spec. So what's in the "Scary Box?" Basically, there are three types of things the tech needs to carry: Tools, Office Supplies, and Parts. The list I give here is actually more than we normally carry these days. We've found that we carry fewer and fewer parts as time goes by. The reason for this is simple: Almost nothing breaks any more. When was the last time you replaced a bad network card? Note: A tech may need other specific tools for a job. These should be provided, but don't need to live in the scary box for each technician. Unlike some businesses (e.g., cabling companies), we need to be very careful to keep the inventory piece of this very small. As technology changes, you are very likely to have some leftover cables or other items that you never use. I think we have five or six old style parrall printer cables at our office. Even though each of these is not very expensive, as a whole they represent a significant chunk of change. In fact, as we phase out tape backups, we have eliminated tapes from the scary box. At $100-$200 per box, this is not a minor investment. You need to balance the need for these items with the cost. The technician is expected to maintain a supply of the items listed (from The Company stock) at all times. If something is used up or sold out of the tech’s supply, they need to get it restocked as soon as possible. The intention is to never be on site without something you should always have on hand. Once the list of items is assembled and inventoried, the technician is to sign for the list of supplies. (You should have a form for signing out keys, security cards, and other company property.) A copy of their list will be maintained in their employee file. Once created, only major item additions and deletions will be tracked. The technician is ultimately responsible for the care and inventory of the items. Any delivery to a client, loss, damage, theft or other disposition of an item is expected to be reported to The Company in the appropriate manner as soon as possible. That is to say, if an item is delivered or left for a client to own and use it must be entered on the product tab of some SR in a timely manner so that it can get correctly billed. If an item is dropped, otherwise damaged, etc. it must be brought to the service manager's attention immediately. The preferred method of informing the service manager is via email. It is reasonably expected that the technician will safeguard any The Company property appropriately. It is expected that it will never be left in an unlocked vehicle or left in any vehicle overnight in a location that could be considered a high crime district. 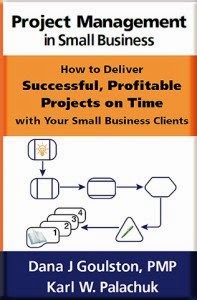 Two hours of audio training - Plus two slide decks in .pdf format. Agenda: Project Management in a Managed Service Business and Zero Downtime Migration Strategies. Also these days I carry a 24 port rack mount switch but thats 10/100 retired from a client. We have a few spare USB drives for moving data, but we don't pack them in the scary box. Cat5 tester... (For those in the UK http://www.maplin.co.uk/peak-atlas-it-network-cable-analyser-31852 is brilliant as it has ID's on the terminators for testing). Joe Panettieri: You're Killin' Me, Man!